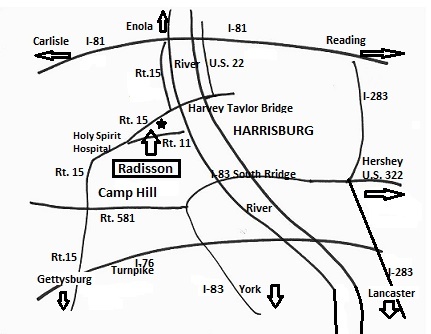 The Radisson Penn-Harris Convention Center, Camp Hill is located at 1150 Camp Hill ByPass (Routes 11/15), Camp Hill, PA 17011, on the West Shore, just across the Harvey Taylor Bridge from Harrisburg. From York & points south, take I-83 North to Route 581 West to Route 15 North (Exit 5A). Go apporx. 2 miles on Route 15. From Carlisle and points west, take I-81 North to I-581 East to Route 15 North (Exit 5A). Go approx. 2 miles on Route 15. From Allentown, Schuylkill County and points northeast via I-78 & I-81, merge onto I-81 east of Harrisburg and continue on I-81 South across the Susqehanna River. Take exit 65 and follow Routes 11 & 15 south for 6.5 miles. From Hershey, Harrisburg & points east, take Route 322 West to I-83 South to Route 581 West to Route 15 North (Exit 5A). Go approx. 2 miles on Route 15. 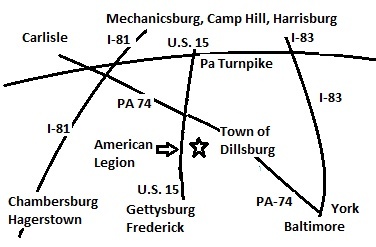 From Gettysburg, Dillsburg and points southwest or Perry County and points north, take Route 15 all the way. http://www.mapquest.com and use 1150 Camp Hill Bypass as your destination. 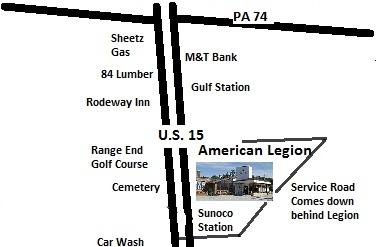 The American Legion, Dillsburg, is located at 301 Route 15 South, Dillsburg. From York take Route 74 North to Route 15 South. From Camp Hill and Route 581 take Route 15 South. It is approximately 8 miles south of the turnpike. The address may not be on your GPS, but it is easy to find. It's next to the Sunoco gas station on Route 15. 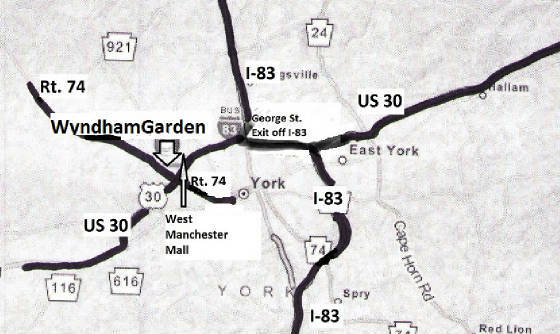 The Wyndham Garden Hotel is located at 2000 Loucks Rd., York, PA 17404, behind the West Manchester Mall at Routes 74 & US-30. Coming from the north or south on I-83, go west on US-30 to Route 74, go north a quarter-mile to Loucks Road and turn right. Coming from the east or west on US-30, get off on Route 74, go north one-quarter mile and turn right on Loucks Road. From the Dillsburg area, follow Route 74 south to Loucks Road and turn left. The Holiday Inn is one-quarter mile north of US-30. For more precise directions from where you live, go to http://www.mapquest.com. Use 2000 Loucks Rd., York, PA , 17404, as your destination. 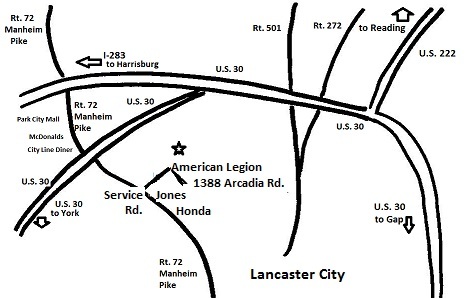 The American Legion, Lancaster is located at 1388 Arcadia Rd., Lancaster, PA 17601. From York, take US Route 30 E 22 miles. Exit at PA-72 S/Manheim Pike. At the end of the exit ramp, look for the Jones Honda showroom on your right. Turn left in front of the Honda dealership onto Service Road. Go 1 block & turn right to 1378 Arcadia Rd. From Harrisburg, take I-83 to I-283 S toward Lancaster. Go 27 miles to PA-72 S/Manheim Pike exit. Merge onto PA-72 S/Manheim Pike. Pass the McDonalds and the City Line Diner on your right. Look for the Jones Honda showroom on your left and turn left just before the Honda dealership onto Service Road. Go 1 block & turn right to 1378 Arcadia Rd. From Reading, Take 422 W to US 222 S. Go 28 miles. Follow signs for US 30 W/I-283 W. Follow signs for Harrisburg until you exit at PA-72 S/Manheim Pike exit. Merge onto PA-72 S/Manheim Pike. Go 0.7 mile & turn left at Service Rd. Go 1 block & turn right to 1378 Arcadia Rd. For more precise directions from where you live, go to http://www.mapquest.com. Use 1388 Arcadia Rd, Lancaster, PA 17601, as your destination. 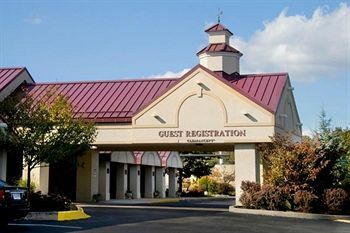 The Holiday Inn Harrisburg East is located at 4751 Lindle Road, Harrisburg, PA. 17111, at Route 441 & Lindle Road, just of of I-283 and Eisenhower Blvd. and just east of the Harrisburg East Mall. From York, take I-83 north to Harrisburg and continue east to I-283 south via exit 46A toward Airport. Get off at Exit 2/PA 441 East of I-283. Turn left onto Lindle Road/441. Go 1/3 mile on your right. From Camp Hill and points east, take Route 581 to I-83. Take I-83 north to Harrisburg and continue east to I-283 south via exit 46A toward Airport. Get off at Exit 2/441 East of I-283. Turn left onto Lindle Road/441. Go 1/3 mile on your right. From Lancaster County, take I-283 north. Get off at Exit 2/441 of I-283. Turn right onto Lindle Road. It's on your right. From Hershey and Palmyra, take Route 322 to I-283 south toward Airport. Get off at I-283 Exit 2. Turn left onto Lindle Road/441. It's 1/3rd mile on your right. From points east and west via PA Turnpike, take PA Turnpike to Harrisburg East Exit (Exit 247). Take I-283 toward Harrisburg. Get off at Exit 2/PA 441 East. It's on your right. From points east and north via I-78 & I-81, merge onto I-83 South toward South Harrisburg/York. Merge onto I-283 South via Exit 46A. Get off at Exit 2/PA 441 East of I-283. Turn left onto Lindle Road/441. Go 1/3 mile on your right. For more precise directions from where you live, go to http://www.mapquest.com. Use 4751 Lindle Road, Harrisburg, as your destination. 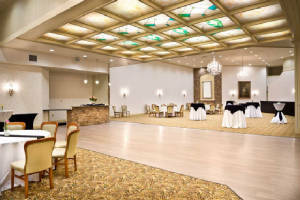 The Valencia Ballroom is located at 142 North George Street, York, PA 17401, one block north of the square in downtown York. George Street is also marked as Business Route 83. Look for the theater-type marquee on the west side of the street with the name Valencia in white neon lights, circled by blue neon lights. Comin g from Harrisburg and the north, take I-83 south to Exit 22 (George Street Exit). Go all the way to the light at the end of the exit ramp and make a right turn, staying on George Street (don’t make the right before you reach that light) and follow George Street 1.8 miles right into town. Look on your right-hand side for the Valencia marquee. Coming from Lancaster and the east, take Route 30 west until you re ach George Street (Business Route 83). Make a left turn and follow George Street 1.4 miles into town. The Valencia marquee will be on your right side. Coming from Gettysburg and the west, take Route 30 east until you reach George Street (Business Route 83). Make a right turn and follow George Street 1.4 miles into town. The Valencia marquee will be on your right side. For more precise driving directions from your home, I suggest that you go to www.mapquest.com and type in: 142 N. George Street, York, PA as your destination. Free Parking. 1. All street parking is free at night. 2. The Valencia has a free parking lot on the north side of the building. In addition, we never had a problem with parking in the lots off the alley behind the Valencia. 3. The Valencia also has a large free parking lot directly across George Street from the Valencia. Avoid parking behind the newspaper parking lot, or beside the auto parts store on the east side of George Street, or in the motel parking lot on the south side of the Valencia. From the north, take I-83 south to Exit 24 Emigsville, turn left onto PA-238/Church Road for 0.9 miles, turn right onto PA-181 South (N. George St., go 0.7 miles. It's on your right. From the south, take I-83, take I-83 north to Exit 22. Merge onto PA-181 north (N. George St., for 1.7 miles. It's on your left. From the city of York, follow N. George Street to 3118 N. George St., Emigsville. Free Parking: Parking lot behind the firehouse. Overflow parking allowed across the street at the insurance company and at other surrounding commercial establishments that are not in operation on Sunday nights.